Today, Tuesday May 1 2018 at 7pm ET (23:00 UTC) the Accessibility NYC Meetup (A11yNYC) will examine LinkNYC Accessibility. LinkNYC is a first-of-its-kind communications network replacing over 7,500 pay phones across the five boroughs with new structures called Links. Each Link provides superfast, free public Wi-Fi, phone calls, device charging and a tablet for access to city services, maps and directions. Speakers: Ruth Fasoldt, Director of External Affairs, Link; Kevin Green, Product Manager, Intersection; Emily Pease, Senior Program Manager, Link. the meetup will be webcast live via A11yNYC YouTube. The Internet Society Accessibility Special Interest Group (in formation) will this week be at 1pm ET on Wednesday Dec 13 2017. Please join and share your #a11y interests. No particular agenda this week, but we will look at the 24 Accessibility, which is posting a A11y link a day for Advent. There will, as always, be an open mic for anyone else to step up and talk about their accessibility concerns. The Internet Society Accessibility Special Interest Group (in formation) will this week be at 1pm ET on Wednesday Oct 18 2017. Please join and share your #a11y interests. This week we will review some recently captioned ISOC videos – Internet Futures: Vint Cerf Interview – and the 2017 Internet Hall of Fame Ceremony, and then demo the open source SubTitleEdit used for the captioning. The Internet Society Accessibility Special Interest Group (in formation) will this week be at 1pm ET on Wednesday Oct 11 2017. Please join and share your #a11y interests. 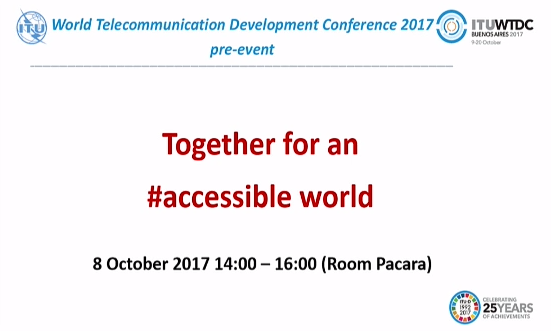 This week we will review the pre-event – Together for an #accessible world – at the World Telecommunication Development Conference (WTDC) 2017 in Buenos Aires. (see video below). The 16th weekly Internet Society Disabled and Special Needs Chapter hangout will this week be at 1pm ET on Wednesday Sep 13 2017. Please join and share your #a11y interests. This week will be an open discussion, and will be the last under the DSNC banner before we transfer over to the Accessibility SIG in formation. The 14th weekly Internet Society Disabled and Special Needs Chapter hangout will this week be at 1pm ET on Wednesday Aug 16 2017. Please join and share your #a11y interests. This week will be an open discussion, but will include aphasia, the subject of last week’s a11yNYC presentation. The 12th weekly Internet Society Disabled and Special Needs Chapter hangout will this week be at 1pm ET on Wednesday Aug 2 2017. Please join and share your #a11y interests. We will be again be discussing the upcoming transition from Chapter to SIG. Also we will feature a newly captioned version of Vint Cerf‘s IGF-USA keynote. Sorry, there will be no live captioning this week. Today, Wednesday Jun 28 2016, the ISOC-NY TV show presents Writing Government Information for People with Cognitive Disabilities from the Accessibility NYC Meetup on Jun 6 2017. The 9th weekly Internet Society Disabled and Special Needs Chapter hangout will be at 1pm ET today Wednesday June 28 2017. Please join and share your #a11y interests. Today’s feature will be a video “Writing Government Information for People with Cognitive Disabilities“. There will be no live captions today, except on the video. The 8th weekly Internet Society Disabled and Special Needs Chapter hangout will be at 1pm ET today Wednesday June 21 2017. An open meeting this week, please join and share your #a11y interests. We may look at last week’s UN Meeting There will also be a news roundup and time to chat on other topics. There will be live captions on the call. The 5th weekly Internet Society Disabled and Special Needs Chapter hangout will be at 1pm ET today Wednesday May 31 2017. This week our special feature will be the presentation at the recent Women’s IGF in Sri Lanka by accessibility advocate Ms. Manique Gunaratne – Senior Trainer at the Employers Federation of Ceylon (EFC) ICT Training Center for the Visually Impaired. Then we will have plenty of time to chat. All who have an interest in accessibility issues are welcome to join the call. There will be live transcription available..
Today, Tuesday January 2 2017, at 7pm ET, Accessibility New York City (A11yNYC) will hold its monthly meetup. This month’s presentation is How Learning ASL Improved my Alt Text. Knowing how to explain things in an inherently visual language can help to explain visual images in inherently non-visual ways. The structure of description in American Sign Language has parallels with the needs of those who can’t see an image, but want to understand it. Speaker Shaun Lariaut will explore the basic concepts around alt text and the basic conceptual structure of visual description, review some examples, pick apart the process of how each piece fits together, and then run through a few examples. The session will be webcast live via A11yNYC YouTube Channel with closed captions. AXSChat is an open online community of individuals dedicated to creating an inclusive world, using social media. They host weekly (8pm UK time) video interviews and twitter chats with people who are contributing to making the world a more inclusive place through technology or innovating to enable wider participation in society for people with disabilities. Today Tuesday October 11 2016 at 3pm EDT (19:00 UTC) they will host Thomas Logan – CEO, Equal Entry & CoFounder of A11Y NYC.. Go to Twitter #AXSChat to join the action.